The November jobs numbers from the Bureau of Labor Statistics show that 203,000 new jobs were created. That figure is higher than what experts had predicted, leading every cable news talking head to exclaim, “more proof the economy is improving.” Really? Let’s look at those numbers more closely. Most of us who worked in fast-food/minimum-wage jobs in our youth (minimum wage was $1.65 when I was in high school) recognized those jobs as part-time in nature, providing us with employment on our journey to something bigger and better. In fact, that is the business model of the fast-food industry and many others that pay minimum wage is the recognition that such jobs are transient by design, usually less than 40 hours per week, and function as transitions to better paying jobs with more of a future for advancement. Let’s be clear: there never was any thought or intent by anyone using the minimum-wage business model of creating a position for someone as VP of French Fries or Hot Apple Pie Division Manager. Yet, the unfortunate result of the recent recession has forced many older workers or overqualified workers who have been unemployed for many months into the fast-food/minimum wage environment. Jobs are slowly returning, yet for many, rebounding back to where they where before being laid off is difficult if not impossible. For most, those professional positions are gone, having either been eliminated or filled by someone else. So, today we hear the demand for a “living wage” from fast-food/minimum-wage workers–and yet 60% of all minimum-wage workers are students. Nearly doubling the minimum wage to $15 an hour means your Big Mac will cost you $8 or $10; your grande skinny latte may run you $9 to $10 or more; and “Big Gulp” is more a reaction than an oversized fountain drink. When you refuse to shell out that much money for these items, businesses will close down; people will get laid off. Attention fast food/minimum wage workers: Your positions were never meant to be career positions where you can eventually earn five or six-figure incomes. You have to escape the fast food/minimum wage mindset and jobs by getting an education (community college, four-year college, trade or business school)–that’s how you earn a living wage. So who do you think is to blame? The small business owners who employ most people? Republicans? Democrats? The fast-food/minimum-wage business model? 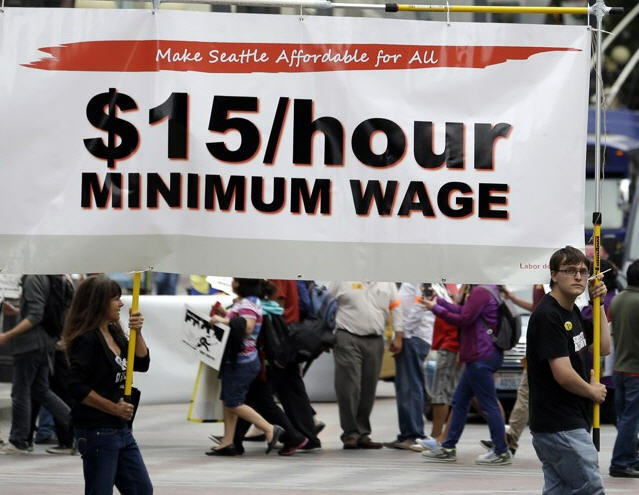 Even President Obama is calling for an increase in the minimum wage, so what’s the story? Virtually every major initiative of the Obama administration – from taxation and regulation to monetary policy and (especially) Obamacare–oops, I mean the “Affordable Care Act” – has been promulgated with little concern for small business. Not surprisingly, 60 percent of business owners surveyed by Gallup expressed opposition to the administration. Small firms represent 99.7 percent of all employer firms and have generated most net new jobs over the past 15 years, according to the Small Business Administration. The Affordable Care Act has forced many employers to cut back on hours of employees, creating a part-time workforce so they can afford to stay in business. Nearly everyone will agree that part-time hours is better than NO hours. Small business owners–the McDonalds/Burger King/Kentucky Fried Chicken/Starbucks franchise owners–provide from 60 to 70 percent of all new jobs, but tax and monetary policies and federal regulation prevent the job conveyer belt from helping people move onward and upward who are stuck in fast-food/minimum-wage jobs. Forbes reports that although the unemployment rate has steadily dropped since of the beginning of the year, “the decline hasn’t been solely driven by the creation of high-paying full-time jobs.” That affirms the premise that more people are being compressed into the part-time minimum-wage job market/conveyer belt, adding to poverty levels. Businesses are sitting on large piles of cash waiting for government tax/economic policies to ease so they can expand, upgrade infrastructure, and hire people for full-time higher paying jobs. The job ceiling has been lowered for these people by the actions of the current administration, which are really regressive policies by an administration that sees itself as Progressive. I find it ironic that the President is supporting the call for raising the minimum wage, which will only stuff more minimum-wage workers into an already over-crowded room.